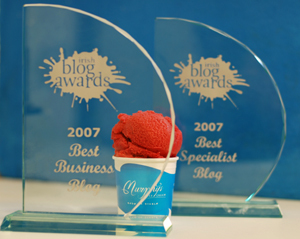 I’m delighted to announce that we have come back from Dublin with two awards from the Irish Blog Awards – Best Business Blog and Best Specialist Blog. Thanks again to everyone who voted in the first round, to the judges, the sponsors, the organisers, and to all our readers and customers. It was a good night. Rick O’Shea did a great job as MC, and of course Damien pulled the whole thing off with style. The best moment for me was when Bernie GoldbachÂ pressed his award on Damien, who certainly deserves acclamation. Pure class. I enjoyed meeting fellow bloggers, including the nominees for the business award who were very gracious and definitely worth keeping an eye on. Krishna De, by the way, has posted the podcast of all of us here. Congratulations to all of the winners and all of the nominees. I was tired from all the travel and didn’t stay very late. 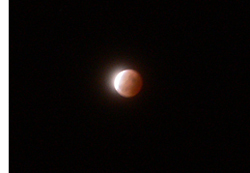 However, when leaving, we had a good look at the lunar eclipse. I didn’t have at all the right camera or lens, but this will give you an idea if you missed it. Way to Go Kieran!! Your blog is just really outstanding and now we know just how much so. well done, have been reading up on your chocolate recipes since meeting you. I even went out this morning hunting for some Murphy’s ice-cream. Unfortunately, my local Fresh (Smithfield) was closed due to the horse fair on, so the hunt will continue tomorrow! Big congrats Kieran. It was great to meet you too. Watch out for us hitting your place in Dingle every day of our summer holidays! Nice to meet you Kieran, though twas quick as you appeared to be waiting for a cab to whisk you away from the glamourous surrounds of the Alexander. 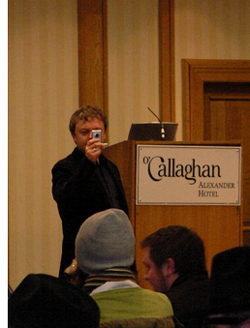 I was quite affected by the shout-out from the stage – very daycint. Anyway, congrats on the awards. This is a great blog with a really solid identity and an interesting voice. I’ll say hello next time I’m in the shop. I’ve been in often but you’re generally quite busy and one doesn’t like to distract someone from his business. It’s hard enough to run one without ice-cream fanboys clamouring for autographs, I’m sure. Congratulations! Those pictures on your blog are wonderful. I’m drooling over the chocolate sundae. Well done on both your awards Kieran! I got my dates all mixed up – thought it was happening on the 11th like a feckin’ idiot – so managed to miss out on meeting up with you all. Grrr…and I was really looking forward to it…need to double check dates from now on! Fantastic news! So well deserved! well done ice cream people! Felicitations Kieran! Delighted to hear you did so well, richly deserved. Also great to see that Fungie’s still going strong! Good stuff. Nice to share the eclipse with you. Well done Kieran! I’m looking forward to my next trip to Kerry to sample the goods! Wow Keiran, I am so happy to hear about this awesome news. Celebrate for as long as you can and live it up! Cogratulations, you really deserve it. congrats on your winnings. You have a great blog here, I shall be visiting more often to whet my appetite. I was considering getting that free scoop, alas it is quite a trek from Belfast – 300+ miles!